Twitter images, the Twitter photo hosting service we broke the news of in late May, has now rolled out to all Twitter users, according to Twitter Public Relations representative Sean Garrett. Users who did not have the feature before will see a camera at the far left of their status update box, beckoning that they upload an image. You can choose an image from your desktop under 3 MB and it will get embedded to your Twitter status like below. If you feel like you’ve made a mistake you can just click on the X to delete and pick another image. Photos uploaded through Twitter will be hosted through Photobucket and appear as a pic.twitter link and image for those who follow you and a “Click to display media” message for those who don’t. Users will not be able to see images from Protected accounts. Users who feel ambitious can add a hashtag to their images and the images will show up in Twitter’s new fleshed out Photo and Video search feature, visible to the right side of your tweet pane when you click through to search for hashtags. 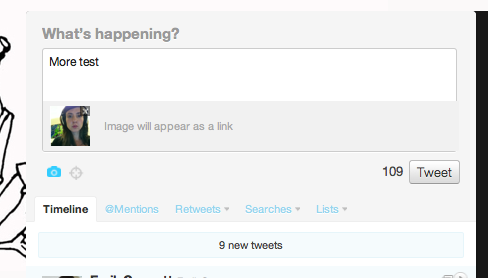 You can also use the shortcuts “sv” and “sp” to search for photos and videos directly from the Twitter.com homepage. Twitter tells me it has yet to enable the feature for its mobile apps, and the ability to tweet directly from the iPhone camera will waiting for the launch of iOS 5 in the fall. Twitter plans on launching user Galleries, another feature that has yet to be enabled. As of yet all the individually uploaded pictures are one offs, but Galleries will eventually aggregate all pictures a user has ever uploaded including those from services like Twitpic and Yfrog. While the baked in upload functionality launched to everyone today is seamless and simple to use, the eventual launch of Galleries (where all user photos can be viewed in one place) will herald Twitter’s true foray into the photo-sharing business and the real threat to third parties like YFrog. Until then we wait.